I couldn’t help but notice that my ticket # ends with 911. That can obviously only happen once a year, but today is special because it has been 10 years since that dreadful day. So I’ve decided to write and reflect on what that day means to me and maybe to some of the other guys in the band. I can’t remember why I was in Manhattan, but I was and we had just come back the day before from somewhere. It was getting late and I was trying to make it home for dinner. It happened that I was passing Madison Square Garden and realized that Michael Jackson was doing a special 30yr anniversary. Long story short: it was sold out, but I got in. I remember Lynette thinking I was crazy for attending last minute. But she knew the Jacksons were one of my favorite groups ever. I enjoyed myself immensely that night, but little did I know that, not only was this going to be the last time Michael Jackson performed with his brother or by himself, but bigger than that… no one would remember September 10th, 2001! That morning I woke up ready to tell Warren about “The Garden” (he is also a big Jackson 5 fan), but instead he told me to quickly turn on the TV. I remember being confused for a bit… did a pilot lose his way and if so, how could he be that far off? While watching the screen, the second plane hit and that’s when it was clear that it was an attack. I was still on the phone with Warren, but I didn’t really know what to say… it was too much too quickly; I couldn’t take it in. This time period is clear for me because we had just started traveling full-time that year and it was still strange to be away from home. I believe we had our first show after 9/11 on 9/17 and it was unclear whether it was going to still happen. I recall thinking it wouldn’t be appropriate… how can we go out and have fun in times like this? It turned out that it was a blessing for us to go. We had a 6-7 week road trip to do in the Midwest (Illinois / Iowa / Minnesota) and everything in New York seemed unreal. Back then we traveled in a 15 passenger van and picked each band member up from their homes. One of the biggest band memories of that first travel day was driving over the George Washington Bridge into New Jersey and looking back at the city. We were in absolute shock! The Twin Towers were not there… only smoke. How could this be? We talked about it for hours and wondered if we were going out too soon after such an awful event. We soon realized that after each show everyone wanted to talk to us about 9/11. It was of great comfort… the songs we did seemed to inspire everyone and felt like just what everyone needed. We could feel God using us to bring about happiness in a time when many were sad. We were honored to be New Yorkers with such a commission! Anyone from New York who travels as much as we do, will be able to relate to what I’m about to say. For the first year or two after 9/11, it was the main subject on everyone’s lips when finding out that we were New Yorkers. The song we sang most was “Amazing Grace”. We sometimes would get emotional because we could see so many people crying in the audience. Not only was it a good time to be on the road, but we were thankful for the mission. Nearly everyone in N7 will tell you that the reason we spend so many long weeks and months away from our families is to simply brighten up someone’s day. I’m so glad we experienced it; we’ve never seen so many people from so many different walks of life come together and work together. Wow! It’s 10 years later and we are still on the road :-)! What a blessing! I don’t take it for granted, not even for one minute. I tried to get out of it because we hadn’t done it in a long time and I wasn’t totally sure if Polo knew it. Then Dwight insisted that is was totally appropriate for the day and it didn’t matter if we sang it right or wrong. So we did it and it was right because it was beautiful and uplifting as only “Amazing Grace” can be. P.S. Thank you to all of our fans for making it possible to do what we love over the last 10 years. And I pray that the Lord will continue to comfort all those that lost loved ones on 9/11. This entry was posted in Roundtrips and tagged 9/11, New York. Bookmark the permalink. Thanks for sharing this Roger. As usual, your personal insights are very touching. God bless you and all the guys and may you continue to make your uplifting and beautiful music for many years to come. 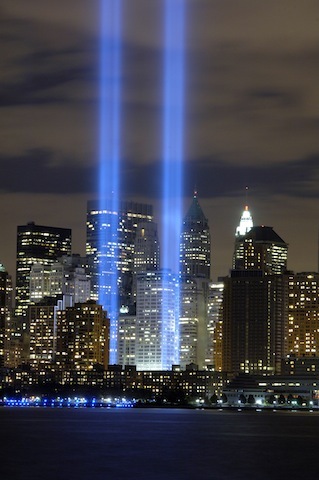 Of course, I too send my love and prayers to all those who lost loved ones on 9/11/01. Wow beautifully written .. very emotional! I love the N7 version of Amazing Grace. I can only imagine how wonderful and touching it must have been for it to be performed for the company on such an occasion! Thankyou for sharing this wonderful insight with us. Nat 7 brings so much joy to all of us. We appreciate everthing you do. Yesterday,I watched your video ‘Be Still My Soul’ that was shot in Switzerland. It gave me great peace as it always does, and is one of my favorites. God Bless all of you. I was just in NYC from Sept 8-10 (I very purposely left before the 11th) and stayed at the Millenium Hilton with a view looking right over Ground Zero. The last time I was there was Nov 2003 and the changes have been phenomenal. Being able to see the memorial ponds, the Freedom Tower so beautifully lit at night, and the 1000s of ribbons tied on the gates and fencing surrounding St. Paul’s Chapel on Church Street, was all really something. I do remember where I was on 9/11/01 and the shock I felt as those tragic events unfolded. Thank you all for the solace, peace and respite you gave to everyone with your music after that day. And as the ribbon I tied on the St. Paul’s Church gate said… “Remember to Love”.